We answer the today’s most prevalent question of “Are We In A Real Estate Bubble”? Have you heard about theEarthquake Brace + Bolt (EBB) program? EBB provides limited funds for improving the earthquake resistance of existing homes. The program is available in limited areas, but San Francisco is one with several zip codes qualifying to receive up to $3,000 to defray the cost of the seismic retrofit. EBB is the first incentive offered by the California Residential Mitigation Program (CRMP), under the direction of the California Earthquake Authority. The EBB program, created in 2011, was put in place to assist homeowners in strengthening homes to withstand earthquake activities. EBB adheres to the California Building Code’s standards for seismic retrofits of existing residential buildings. Those San Francisco zip codes listed on EBB’s website are: 94102, 94103, 94107, 94108, 94109, 94110, 94112, 94114, 94115, 94116, 94117, 94118, 94121, 94134, 94122, 94123, 94124, 94127, 94131, 94132, 94133, 94145, and 94151. The California Earthquake Authority is offering new insurance policy options this year, including deductibles ranging from 5 to 25 percent, higher coverage limits for personal property and additional living expenses, and a bigger discount for homeowners who submit verified proof of retrofitting. The article goes on to say after Jan. 20th the residential mitigation program will provide up to $3000 to owners for seismic upgrades. Less than 10% of homes in California have earthquake insurance, so there is a huge exposure by the majority of homeowners in a state that is known for earthquakes. Most do not have coverage due to the premiums and deductables. This year homeowners can choose a variety of deductibles from 5%-25%. The old options were only 10% or 15%. There is also an option to increase the coverage of personal property from $100K to $200K. Overall premiums will be lower by 10%, they may go up for older homes; but that can be offset by retrofitting the home. The cost to retrofit a home with a raised foundation can be $4000-$5000, so the discount and additional safety are worth the work. There are programs to help pay for the work, such as the Brace & Bold program. Homeowners can receive up to $3000 for the work, with funding available for 1600 homes. Applications must be submitted between Jan 20th and Feb 20th, so get yours in sooner than later. Now is a great time to get coverage with the earthquake authority and protect you home. It’s California, earthquakes are a matter of when here. we had with clients, business partners, friends and family! You can browse all the photos here. and to Kelly Kearny of Pacific Fine Foods for all the tasty treats! Please remember to “Fall Back” and set your clocks back 1 hour on Nov 1st. 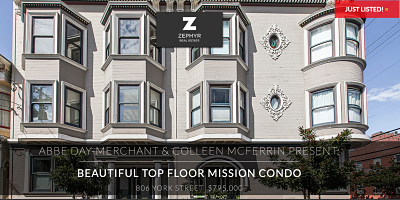 Trendy Mid-Market gem in Mission Dolores! This spacious (867 sq.ft. per public tax record) top floor penthouse is the ultimate city living with views, open floor plan and beautiful natural light from walls of windows. Life style amenities include upgraded kitchen with breakfast bar, and bathroom, wood burning fireplace, wood floors, high ceilings, walk-in closet, great storage, 1 car parking, quiet, secured elevator building and a shared roof deck with spectacular surrounding city views – everything on your list and more! Pearl Street living is easy in this convenient location; so close to shopping, cafes and restaurants, MUNI & BART, the Mission, Castro, Hayes Valley, Valencia St. and excellent access to freeways. 97 Walk score says it all making this home a dream come true! Amazing 2 car+ garage and back yard ready for all walks of life! Large, Beautiful Portola Home across from the newly renovated Palega Recreation Center! A lovely formal entry with vintage lighting greets you upon entering this very special home. The living room features stunning hardwood floors, a wood burning fireplace, vintage ceiling details and sweeping open views of Palega Park. Entertaining is a joy in the formal dining room with an open floor plan right off the kitchen. The bright, vintage style kitchen with granite counters, new stainless steel refrigerator and gas range opens into a charming breakfast nook complete with period built ins. The tiled bath has a tub and separate stall shower. Two very spacious bedrooms with views to the large and sunny garden complete this floor. On the ground level you will find the Enormous Garage with separate entrance, wonderfully high ceilings, both work and storage spaces, plus – are you ready…parking for 3 or 4 cars, along with access to the extra-large garden; these spaces are just waiting for your vision! This home is a true opportunity to move in, start living, and plan for the future! Centrally located on a quiet block in Portola, it has been highlighted as “Curbed SF’s 2013 Neighborhood of the Year”. Just a short distance to wonderful neighborhood treasures like McClaren Park & Alemany Farmer’s market and the desirable Cornerstone Academy. Easy Public transportation, shopping, restaurants and get your morning started at Four Barrel Coffee! Great access to freeways 101 & 280.